Tiller can pull up to 90 days worth of transaction data from most institutions. If you want more transaction data in your sheet you can review the steps for getting data from various sources into your Tiller spreadsheets. Note: these steps were documented for Tiller powered Google Sheets, but similar workflows can be used for Excel. It's pretty painless to download a CSV file for your bank directly and format it for use in your Tiller spreadsheet. We've put together a few help guides on getting your historical bank data out of other financial tools and into Tiller. 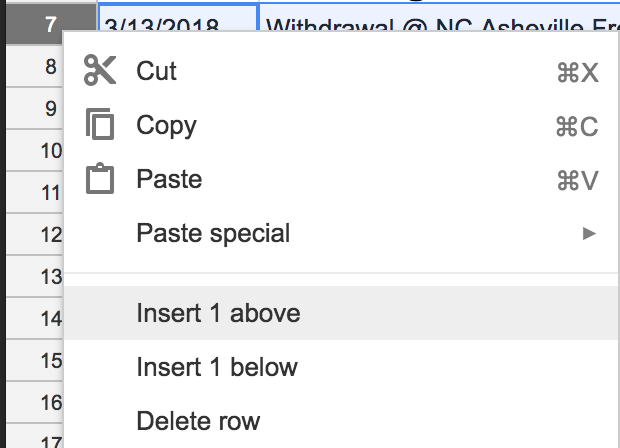 If you need to manually add a transaction here and there, you can add these by inserting a row into your Transactions sheet and filling in the details by hand. Right click a row number and choose Insert 1 above or below.